The 2011 NBA draft. IT’S ALMOST HERE. Y’all, the anticipation is KILLING ME. Then you’ve got the rest of the teams that need mega re-working. Perfect example: Lakers. Kobe has been… frankly horrible the past few months. He can’t be the one to pick everyone up and continue being the star player. He needs help. While the lakers have invested in size, the rest of the NBA has become more focused on speed and skill, leaving the Lakers in the dust- as seen by their playoffs this year. Just you wait- as soon as Lebron gets a ring (which I pray never happens) he’ll be crashing Kobe’s best player on the planet club, and everyone knows it. James has already topped Kobe on the NBA jersey sales. “He’s the best passing guard at his size since Magic,” Doc Rivers has said. But anywhoozle, the drafts. To be honest, I think the unpredictable season we just had will be followed up with an unpredictable draft. I don’t think there are too many assumptions to be made that are totally dead-on. We’ve got a crap load of talent, I’ll give you that, but who knows what the future holds? All I know is I’ll be watching Kawhi Leonard, Jimmer, Derrick Williams, Brandon Knight, Jordan Hamilton, Kemba Walker and Kyrie Irving like a freaking hawk. This thursday. Be there or be square. peace, sunshine, & TWO MORE DAYS!!! 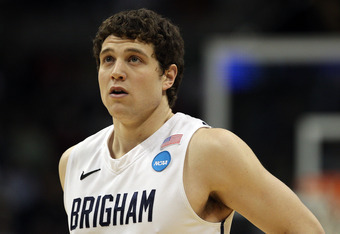 PS- I had to fling in a picture of Jimmer just to make this post that much better. PPS- This is one of the funniest sports blogs I have ever seen. CLICK IT. NOW. I swear you will thank me later.